“According to MBIE, a price-cost ratio of less than 1.5 indicates that land markets are operating well, but higher values indicate the likelihood that developable land supply is scarce relative to demand. The price-cost ratio for Hamilton stayed below 1.5 for most of the past 20 years, but rose sharply between 2014 and 2016. In 2017, the price-cost ratio was 1.66, which suggests that a shortage of suitable land is having an inflationary effect on dwelling prices. More importantly, these high land prices are likely to be reducing the supply of new dwellings coming onto the market. Unfortunately, the price-cost ratio does not identify the cause of land shortages, and instead provides only a blunt indicator of likely scarcity. Accordingly, it should not be interpreted as a failure by stakeholders, such as the Council, to provide adequate land. Here the 1.5 value for the ratio is the point of under-supply and a buffer of 1,000 vacant residential sections maybe too small a number to meet demand. The rules for supply of land come first from the District Plan (DP), which limits the size of sections to 400m2 ‘permitted’ for most of the city. In the DP 2012 submissions from the Property Council NZ, PRS Planning Services Ltd, and in the 1990 review of the District Scheme, the Waikato Master Builders Association, the NZ Institute of Architects, and the NZ Institute of Surveyors (Waikato Branch), asked for a reduction in the minimum site area from 400m2 to between 350m2 and 375m2. As an example, dividing a 6,000m2 parcel of land by 400m2 gives 15 sections; if this is changed to 375m2 or 350m2 the 6,000m2 parcel of land allows for 16 or 17 dwellings respectively, giving a 6% to 13% larger buffer. This could be largely about the number of players in the property market. Again this stems from a political decision to reduce the areas zoned for higher density housing in each review of the DP. 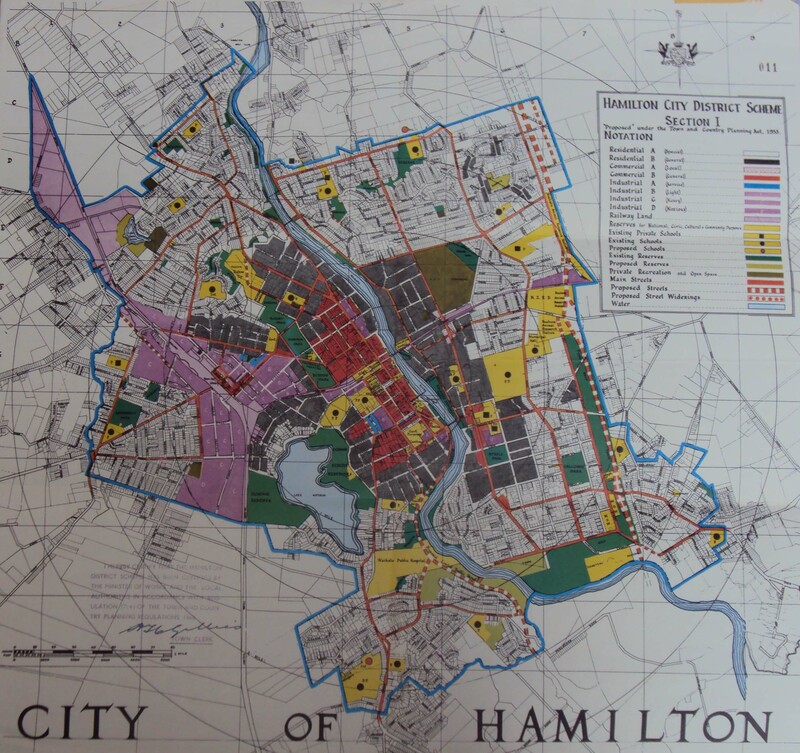 In the 1960s, 10% (278ha) of Hamilton city was zoned Residential High Density. The latest DP has it down to 2% (208ha), which means the number of smaller infill developments is reduced, leaving growth provision to major land owner-developers, and the city at the mercy of a reduced number of land owners/speculators. The outcome is totally predictable. To conclude, it is fair to say the price-cost ratio graph above does show the rapid pace of change. In hindsight the spikes are predictable. The council’s focus on numbers of sections missed the question of how many land owners are in the land supply market. 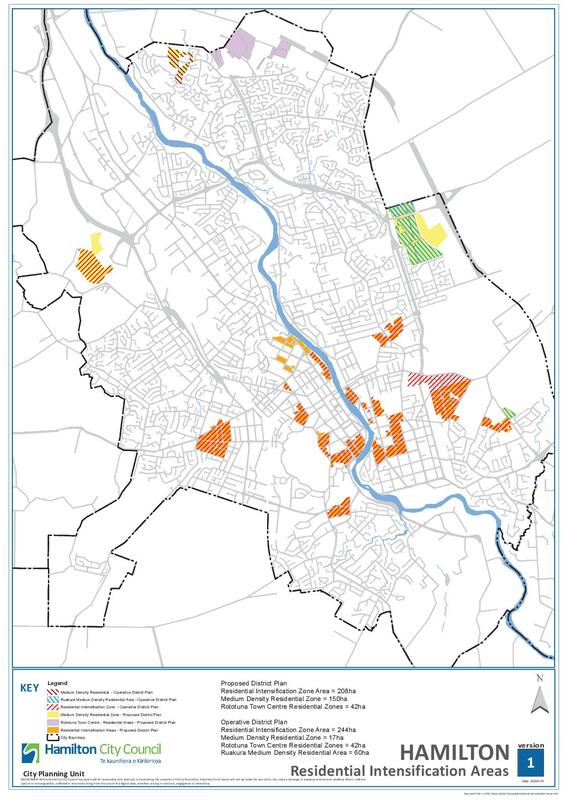 This means you could have a buffer of 2,000 sections, but if the number of speculators doesn’t increase and the influence of controlling major land owners/speculators doesn’t reduce, the price-cost ratio is not owned by the city council. The first map from the 1960s is essentially the land that should be available for high density mixed use development in Hamilton. Rather than continuing to build car dependent sprawl, the council should be focussing on a compact walkable city. A city based around mixed use neighbourhoods with good access to employment in the city centre and peripheral areas. Currently walking around Hamilton is a horrible experience, and it’s no wonder that despite the city’s small population, it has unacceptable levels of peak traffic.